Introduction: There has been a recent interest in robotic adrenalectomy due to improvement of technology. The lateral transabdominal robotic approach has been reported. The posterior retroperitoneal (PR) approach has been described laparoscopically, but there are no reports robotically. The challenge with this latter technique is related to close spacing of ports to access the retroperitoneum. We report our initial experience of 5 cases with description of technical aspects and outcome. Methods: Within a 4-month period, patients with adrenal tumors suitable for a PR approach were consented for the robotic procedure. With the patient in a prone jackknife position, Gerota’s space was entered using an optical 12 mm trocar and using a balloon dissector, a potential space was developed. Two 5 mm robotic trocars were then placed at each side of this camera port. The docking of the robot was performed by bringing the robotic arms from the head of the patient, after rotating the OR table 30 degrees ipsilaterally. The procedure was performed using a 30-degree down-looking laparoscope, and 5 mm instruments (Harmonic scalpel and a grasper) for minimal collision. Results: There were 4 women and 1 man with a mean ± SEM age of 50 ± 8. The pathology included nonsecreting benign adrenocortical adenoma in 2 patients and pheochromocytoma, subclinical Cushing’s and lymphangioma in 1 patient each. Tumor size was 3.1 ± 1.7 cm. Estimated blood loss was 13 ± 22 ml. Operative time was 183 ± 26.0 minutes. Mean robotic docking time was 28.4 ± 18.7 minutes and console time 97.0 ± 31.6 minutes. Docking time decreased from 60 minutes for the 1st case to 16 minutes for the most recent case. There was minimal change of instruments and camera cleaning. All patients were discharged home in 24 hours. There were no complications at 2-week follow up visits. The subjective feeling of the surgical team was that the robotic approach provided better dexterity and visualization compared to laparoscopic PR adrenalectomy experience. 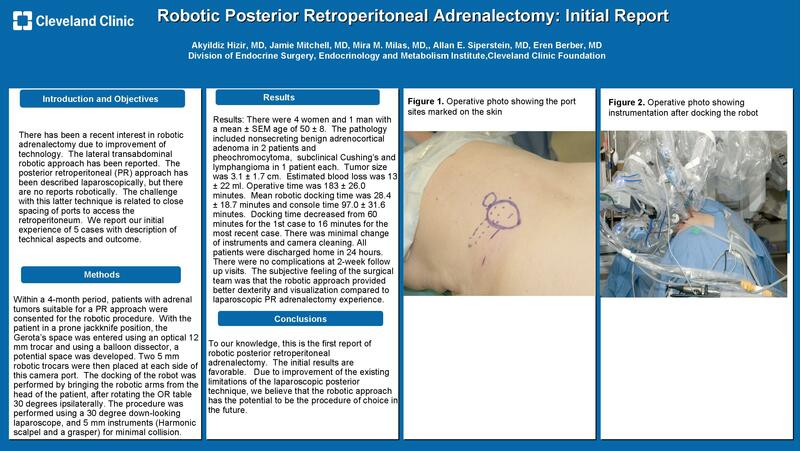 Conclusion: To our knowledge, this is the first report of robotic posterior retroperitoneal adrenalectomy. The initial results are favorable. Due to improvement of the existing limitations of the laparoscopic posterior technique, we believe that the robotic approach has the potential to be the procedure of choice for posterior retroperitoneal adrenalectomy in the future.